Indo Tibetan Border Police Force Invites Online applications from eligible male citizens of India for Constable Jobs. ITBP Recruitment 2018 Panel offers 241 Vacancies for the post of Head Constable & Constable. ITBP Recruitment 2018 online applications will start on 09.01.2018. So, the interested candidates can apply for ITBP Jobs 2018 through online @ www.itbpolice.nic.in on or before to the Last date. The closing date for Indo Tibetan Border Police Force ITBP Recruitment 2018 Online Applications is on 07.02.2018. ITBP Recruitment 2018 published the latest advertisement on Head Constable & Constable Jobs under Motor Mechanic Discipline. The eligible candidates can apply for ITBP Recruitment 2018 Head Constable through online mode only. The ITBP Online Applications 2018 will open on 09.01.2018. The closing date for ITBP Head Constable Recruitment 2018 is on 07.02.2018. So, willing aspirants can check the appropriate conditions for Indo Tibetan Border Police Force Recruitment 2018 and apply a day before to the last date. Here we surveyed the essential details of ITBP Head Constable Notification 2018 and listed below. Scroll down to get them. Age & Qualification are the two basic factors for any Central Government Jobs. For ITBP Jobs 2018, Eligibility Conditions described below. A minimum of 18 years of age & a maximum of 25 years as of 07.02.2018. The aspirant who applies for ITBP Head Constable Jobs 2018, should pass 10+2 from a recognized Board. Should Possess Certificate in Motor Mechanic from a recognized university. The candidate should pass in 10 th standard to apply ITBP Constable Jobs 2018. Three years of Experience in Respective trade from a Recognised firm. Besides eligibility conditions, few more added analysis such as ITBP Selection Process 2018, important dates, ITBP Application Fee listed below. The application fee for ITBP Head Constable Recruitment 2018 cataloged here. Check it. For General & OBC Candidates, An Amount of Rs. 100/- is the application fee. While SC/ST & Ex-Serviceman are exempted from application fee. The willing candidates can check the eligibility criteria for ITBP Recruitment 2018 & apply online for ITBP Jobs 2018. The ITBP Head Constable & constable Recruitment 2018 Online applications will open on 09.01.2018. The last date for ITBP Jobs 2018 is 07.02.2018. Meanwhile, check the article thoroughly and apply for ITBP Recruitment 2018 a day before to the closing time. Visit www.itbpolice.nic.in which is an Official Website. Check for ITBP Notification 2018 for Head Constable & Constable Jobs. Download it from Official Site or you can directly download from the link provided down. Read carefully before applying for ITBP Jobs 2018. ITBP Online applications 2018 will open on 09.01.2018. Fill the essential details as per requirement. Latest ITBP Recruitment 2017 Head Constable Notification released | 62 Head Constable (Combatant Ministerial) Vacancies | Last Date to Apply – 13th November 2017 | Apply Online @ itbpolice.nic.in. Indo-Tibetan Border Police Force issued a new notification for filling 62 Head Constable Posts. Interested candidates can apply online for ITBP Vacancy Constable by referring the eligibility conditions. The starting date to fill the online applications is 14th October 2017 and the last date is 13th November 2017. Go through the below sections for more details of the ITBP Head Constable Recruitment 2017 such as selection process, pay scale, etc. The Indo-Tibetan Border Police Force is going to conduct ITBP Constable Ministerial Recruitment 2017 for filling 62 Head Constable (Combatant Ministerial) Vacancies. Hence, aspirants who are searching for the Police Jobs can apply for the ITBP Head Constable Jobs through online mode only. The ITBP Online Form is available at the official website www.recruitment.itbpolice.nic.in. Before going to apply, aspirants have to ensure their eligibility first. And, the persons who met eligibility requirements are allowed to apply for the 62 Constable Ministerial Jobs in Indo-Tibetan Border Police Force on or before 13th November 2017. Go through the below sections for more details. Aspirants who are interested to apply for the ITBP Head Constable Recruitment 2017 can check the qualification details in the www.recruitment.itbpolice.nic.in Notification 2017 enclosed below. Those people who are going to apply for the ITBP Head Constable Jobs 2017 must have an age within the limits specified by the board. Check the official notification for the age criteria and upper age relaxation. The Indo-Tibetan Border Police Force will recruit candidates through their performance either in the written test or interview. As per the 7th Pay CPC, the selected candidates in the ITBP Constable Ministerial Recruitment 2017 will get a Pay Scale- Level-4 in the Pay Matrix, Rs. 25500-81100. Starting date to apply online – 14th October 2017. Final date to apply – 13th November 2017. Aspirants whose qualification and age limits matched with the eligibility requirements can apply for the ITBP Jobs 2017 through online mode. Candidates can directly apply for the ITBP Recruitment 2017 at the official website www.recruitment.itbpolice.nic.in. For any further information of the Head Constable Recruitment in Indo-Tibetan Border Police Force, refer the official notification attached below. ITBP Recruitment 2017 Notification was released for 21 Sub Inspector (Overseer) Vacancies. Interested aspirants can check their Eligibility Criteria for the ITBP Jobs 2017 at the official site. Eligible aspirants can apply to ITBP Constable Recruitment 2017 before 7th September 2017. Check out other information of ITBP Vacancy 2017 like Application Procedure, Pay Scale, Selection Process. Apply online for 303 Indo-Tibetan Border Police Constable Jobs @ itbpolice.nic.in. Here is the Latest Employment News regarding the Delhi Government Jobs. The Indo-Tibetan Border Police Force announced a notification for filling 303 Police (Tradesman) posts. This is the wonderful opportunity for the aspirants who are searching for the Govt Jobs. We inform the Job Seekers to utilize this chance and submit the online applications before the last date. The ITBP Recruitment 2017 Online Apply link will be active from 29th July 2017 to 7th September 2017. Since after this date, the application link will be disabled, it’s better to apply before the due date. Interested individuals should check their eligibility for the ITBP Vacancy 2017 in itbpolice.nic.in Notification. Our team has posted all the essential information regarding the ITBP Constable Recruitment 2017 here. So, we intimate the postulants to read this complete article for other details such as selection process, age limit, application fee, etc. Postulants should check the Eligibility to apply for the ITBP Constable Recruitment 2017. Aspirants who satisfy the mentioned Educational Qualification, Age Limitation conditions can apply for the Constable (Tradesman) Jobs in Indo-Tibetan Border Police Force. Interested postulants can check the Education Qualification details on the official notification available at www.recruitment.itbpolice.nic.in. The individuals applied for the ITBP 2017 Recruitment will be selected by either conducting Written Test or Interview. Refer the Official notification for the complete details of the selection process. The Candidates selected in the Indo Tibetan Border Police Force Recruitment Process will get Level – 3 in the Pay Matrix Rs. 21700 – 69100 (as per the 7th CPC). Interested applicants should check the Application Fee in the official advertisement available below. All the eligible individuals those who are interested in participating the ITBP Constable Recruitment 2017 should apply before the last date. The higher officials will not accept the online application forms after the last date i.e 7th September 2017. Therefore, it’s better to submit your online application forms earliest at the official website www.itbpolice.nic.in. Most aspirants face difficulties for finding the apply online link. Hence, we provide the direct link to apply for the 303 ITBP Jobs 2017. Also, we list out the simple steps which are useful for the submission of application form. Follow these points and complete your registration process. How to Apply for ITBP Constable Vacancy 2017? First of all, log on to itbpolice.nic.in which is the official web portal of Indo Tibetan Border Police. Select the “Recruitment” Tab on the homepage. Click on the link of Indo Tibetan Border Police Recruitment 2017 Notification. Open it and refer the advertisement thoroughly for all the details. If you meet the eligibility conditions, click on the ITBP Recruitment 2017 Online Apply link. Now, fill up the application form with your details. Check the filled details once before you submit the form. Upload the essential documents and pay the application fee. After successful completion of the application form, take a printout of it for further reference. Here is a good news for all the candidates who were looking for Police Jobs. The officials of Indo Tibetan Border Police is inviting applications from the skilled and dynamic candidates to fill the vacancies of Sub Inspector (Overseer) posts in various departments. As per this Latest ITBP Recruitment 2017, there is a total of 21 vacancies available. So, What are you waiting for here is the awesome opportunity to settle in your native state. Candidates who have done a Matriculation in the relevant field are only eligible for this ITB Police SI Overseer Recruitment 2017. Hence the eligible candidates may apply for this ITBP Police Sub Inspector (Overseer) Vacancy 2017 through the official website, i.e., www.itbpolice.nic.in until 22nd September 2017. More on this topic such as ITBP SI Eligibility Details, Selection Process, Indo Tibetan Border Police Sub Inspector Exam Date, Pay Scale, Application process, etc. are mentioned in detail below. Also check Latest Police Jobs 2017-18 here. Age Limit for Indo Tibetan Border Police Vacancy: The age limit of the candidates applying for ITBP Recruitment 2017 must be between 20 to 25 years as on the closing date of the application form. However, age relaxations are applicable for reserved categories as per the rules of the government. Educational Qualification for ITBP SI Jobs: A matriculation or equivalent from a recognized Board is required to apply for ITBP Sub Inspector Recruitment 2017. Aspirants can also go through the official notification to know more details regarding educational qualification. How to Apply for 21 ITBP Sub Inspector Jobs? All the interested and eligible candidates may apply online for this ITBP Sub Inspector Recruitment 2017 through the official website, i.e., www.itbpolice.nic.in between 12/08/2017 to 22/09/2017. 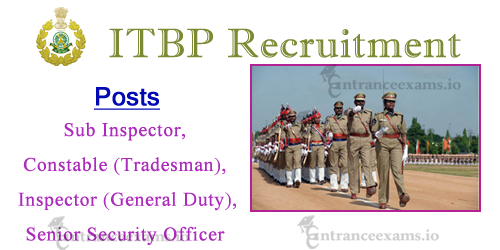 One can also apply online for IBTP Sub Inspector (Overseer) Jobs through the below link. Click here for instructions to apply online. Our entranceexams.io team will post further details of the ITBP Recruitment 2017 here very soon. Therefore, stay connected with this page for the Latest updates. Also, leave your comments about the Indo Tibetan Border Police Vacancy 2017 in the comment box provided below.